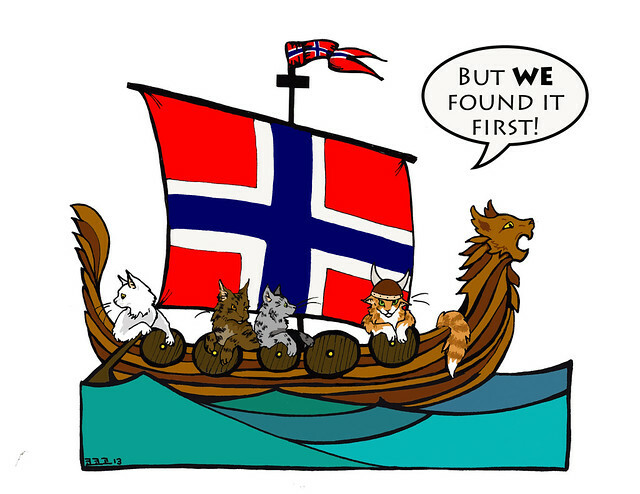 Whilst working on a new project for the upcoming NEMO show, I came across an old drawing I did for Iris five years ago for the National Norwegian Forest Cat Breed Club’s show catalogue (the show was around Columbus Day, as I recall). I’d forgotten all about it, but considering where I live now, it was too funny not to share. Seeing it again also reminded me that I had always wanted to colour it. So, it being a rainy Tuesday, I figured, what the heck? I love the coloring job!